This afternoon I had a couple of hours to spend on sewing/crafts and since I have a box of 6" grapevine wreaths that I have been itching to use, I decided to create some Valentine's Day wreaths. This is the first one that I completed this afternoon. The smaller heart is covered in some wide vintage lace, and the bow is constructed from additional vintage lace and a larger piece of ivory tulle. 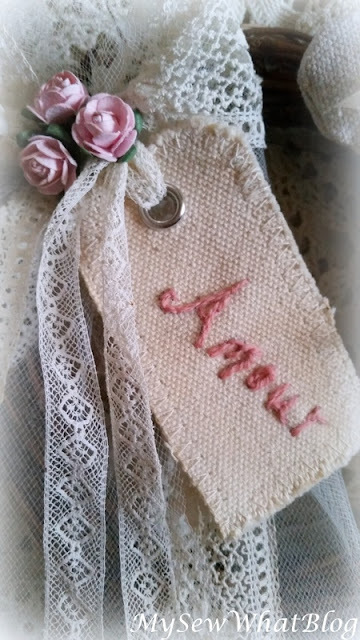 I embroidered "Amour" in mauve colored floss on the tea-stained, canvas tag which also has some narrow vintage lace tied through it. It turned out exactly as I envisioned it. I love it when that happens! A closeup of the bow! 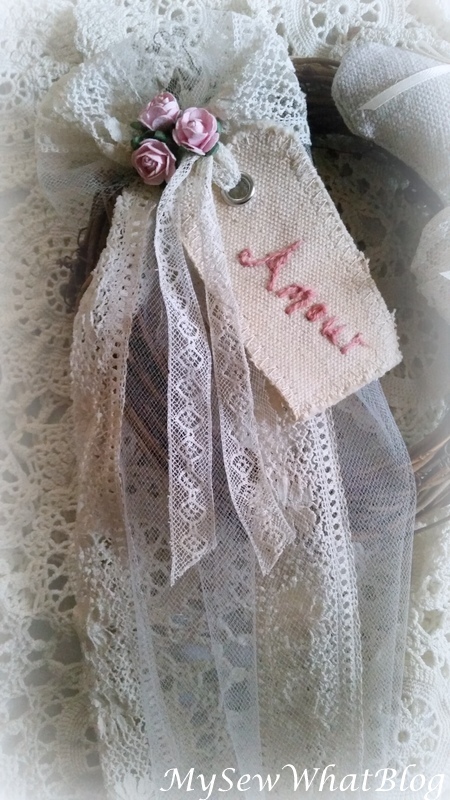 I zig-zag stitched around the edges of the canvas tag and embroidered it before tying narrow vintage lace through the grommet. 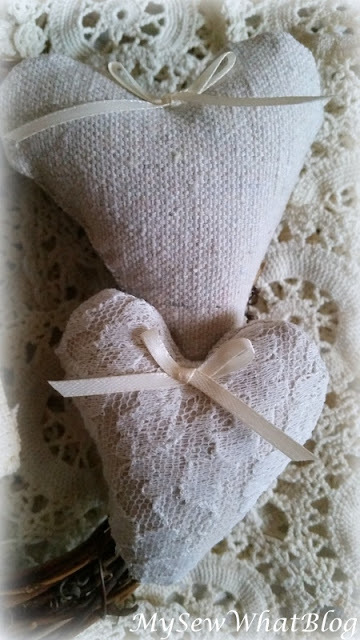 I stitched and stuffed these sweet little hearts and attached satin bows. The fabric is 100 % cotton canvas. Did you perhaps notice this pile of of crocheted pieces underneath my wreath? 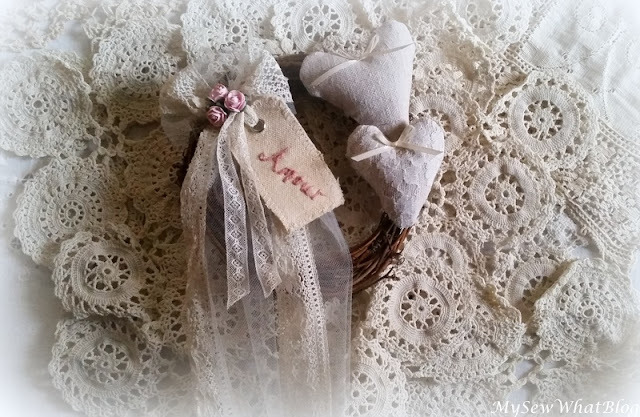 I recently purchased them at this beautiful little antique shop that I frequently visit. They are perfectly sized for totes, pillows, etc and I cannot wait to begin some projects so that I can use them. They happened to be sitting on my table while I was photographing my wreath so I decided to use use them in my photos. Many thanks for your sweet comment! I am spending some time today visiting my favorite blogs and was happy to pay you a visit and see your post about "in between" decorating! Always an inspiration my friend!!!! Your wreath is just beautiful, isn't it wonderful when our projects turn out just the way we had envisioned them too! Thank you! Yes it is wonderful when things turn out right!!! I have had many days of late where nothing has turned out right....lol....so I was long overdue for some success!!!! Hi Kitty! Thank you for visiting and leaving such a sweet comment! Things did get a little crazy again (another hospitalization) but local this time. I miss spending time on sewing, crafting and cooking!!!! Can't wait to begin a new project! Hope all is well with you! Enjoyed your latest post today! Thank you!!!! 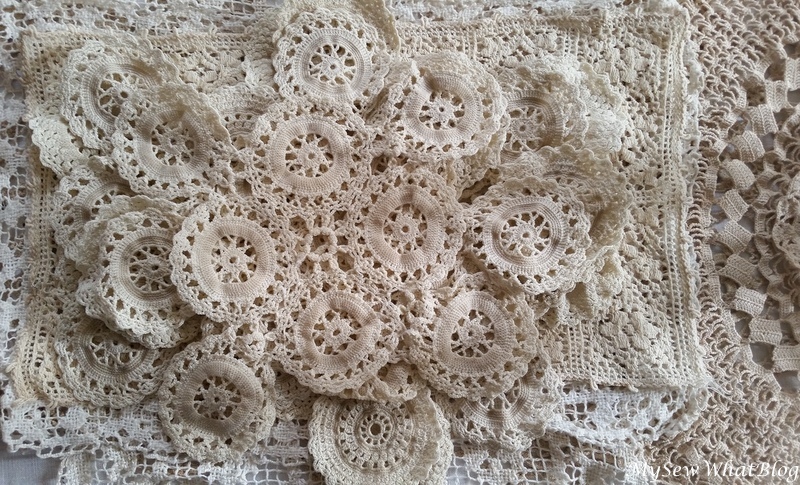 I do love working with old lace!!! Stopped by to see you today, enjoyed your photos as usual!!! Hoping all is well with you too my friend! Linda, This is so beautiful and perfectly romantic! Thank you so much for sharing with us at Snickerdoodle Sunday! Pinning and tweeting to share. Have a wonderful rest of the weekend! Thank you so much Laurie! I have been away for a bit so it's been a while since I linked up. Happy to join in this week! Have a great week! You have been in my thoughts, dear friend.... Wishing you a beautiful new week. Love and hugs! So glad you stopped by. Funny I think of you and all my tea swap buddies every time I drink tea. (which I happen to be doing right now!) Thank you for your kind words. Yes, it's nice to have a bit of time for sewing and crafting. It's sporadic right now as we are in the middle of another hospital stay but hoping for some normalcy soon! Have a nice week! Your Valentine wreath is adorable! Love the creativity you used in making it so unique and pretty. Thank you so much for stopping by and for your kind comment!I appreciate it! Have a great week! What sweet and precious sewing projects you are working on! 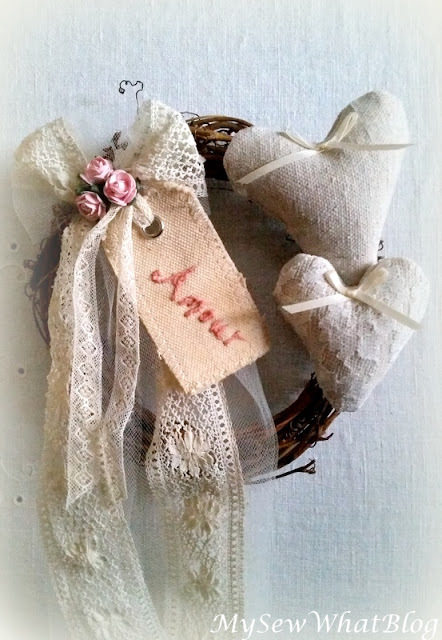 I love them all and oh this heart wreath...perfection. I know the meticulous stitches that go into your projects, always beautiful work that you do. This is lovely, Linda. It's so delicate and the embroidery is a perfect touch. Pinned and Tweeted. Thanks so much for sharing at Snickerdoodle Sunday! Thank you Beverly! Happy to share! I love cutting up vintage linens for things. That is a real cute wreath and you did a great job! Me too! Many times you can use less than perfect vintage linens in crafts and sewing projects which is nice. It means we can keep the perfect ones and just admire them! Thanks for your kind words. So appreciated! This was so pretty and sweet Linda. I will feature today at Home Sweet Home! Thank you very much! Thanks also for hosting! Hope to get back this week! Thank you for the feature! I appreciate it so much! Hoping to join in again this week! The heart wreath is so lovely Linda! There's something about lace that speaks to me...speaks to all of us on some level I think. 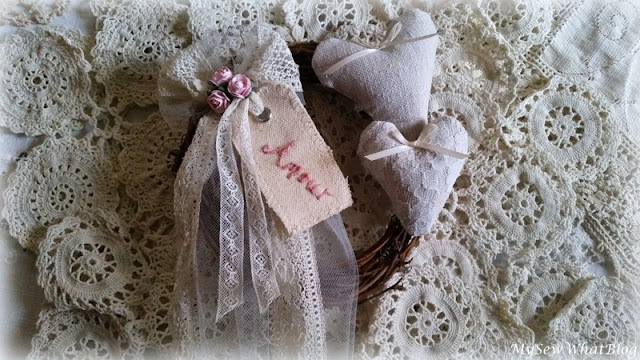 It's so feminine and nostalgic, and lends itself to such romantic designs and projects. Hope the therapy is going well. 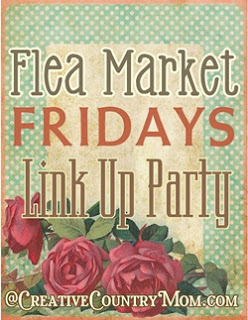 Popping back by to let you know that your lovely wreath is featured at this week's Snickerdoodle Sunday Party. I hope you'll have a chance to party with us again. I love your wreathes. Such a nice idea!